Local history is like a detective game:by itself a scrap of information seems worthless, but, when put together with a pile of other scraps, slowly, if you are luck, a picture will begin to emerge. 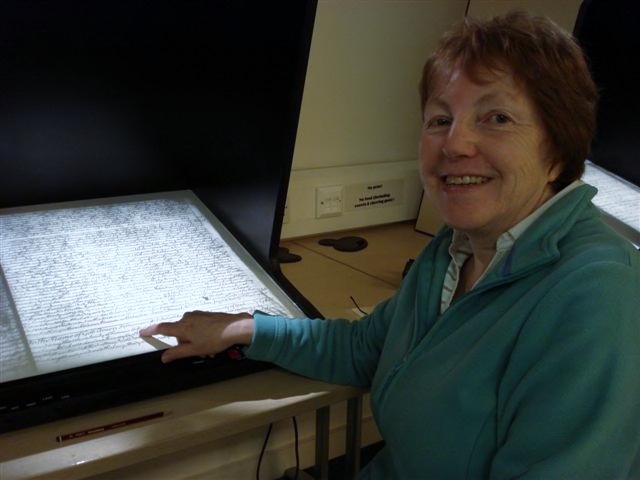 Following a trawl around local archive indexes, Barbara Winfield has done a fantastic job locating a number of scraps of information – newspaper cuttings, wills, and deeds – about Kelcliffe and its owners. To date she has visited Wakefield Registry of Deeds, West Yorkshire Archives at Calderdale, and the Borthwick Institute at York University. So, one evening, just before Easter, as snow lay deep on the ground in early spring, we sat down to see what we could make of the scraps. A key piece of work was to try to work out how the field names have changes over the centuries. This was done by a process of elimination, lie of the land, and some evidence of how big some of the fields were in acres, roods and perches. What we have established is that Kelcliffe was a tannery going back to at least the seventeenth century. The field names only changed in the nineteenth century when Marshall Grimshaw, a farmer, purchased the land in 1837 from tanner Matthew Craven. Field names are important as they are very bound up with the history of the land, if you can unravel a field name, you have an historical record. This is what we have found. Great Brow – the steep field in the Park, was previously called Potterton Brow or sometimes Low Brow. Little Brow – where the south side of Hillside Avenue is, was Tan House Brow (for obvious reasons). Farm Lands – above the Park, the field where the horses are kept and the path goes across, was Farmdales. Kelcliffe Dole – where Nethercliffe Road is now; was called Wood Close (for obvious reasons). Especially as it was next to Greenshaw Close, another name indicating woods. Long Close – the area from Hillside Rise to the north part of Hillside Avenue kept the same name, as did the fields directly around the house. The most interesting part of this is that the name Tan House Brow went, and we are left to ponder what the relevance of Potterton was to local people: and why Potterton Brow was not next to Potterton Ing. Barbara also has another growing theory, that the Park was on the edge, and part of, the Great West Field – which would have been an important part of the feudal common land system. The Great East Field, being Carlton Lane way. Putting up theories, and testing them is all part and parcel of the detective game that is local history research – the key thing is to keep an open mind and not to let ‘romantic notions’ take on a life of their own in the face of the hard evidence from those oh so important scraps. The next task is to look at some of the manor court records going back to the sixteenth century and earlier, which Barbara has located in several archives. The manor courts were held regularly, and every tenant and freeholder had to attend. They give the records of land transfers, disputes, fines for transgressions eg letting your cows wander onto crops, agreements over land use, and how people joined together to mend roads, clean ditches and keep the communal infrastructure in order. It is a great place for scaps, although often written in Latin. Now we have established field names, it may be a little easier – or there again it may not !! One of the real bugbears of tracking the history of land or a family, is the habit of calling an eldest son, after his Father – and the fact that people were not particularly inventive with names, William, Thomas, John, James, Joseph, being common. It can be a pleasure to find a David or a Mark, and a thrill to find a Jabez, Seth, or Moses. Anyway, at least the weather is warming up a degree or two, and the days are getting longer !! This entry was posted in All Our Stories, History, Uncategorized. Bookmark the permalink.